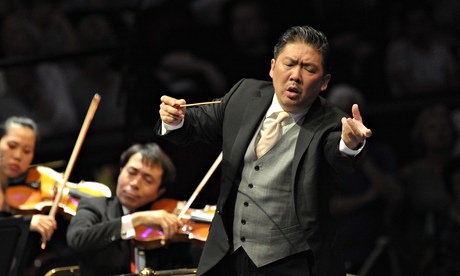 The China Philharmonic, with its artistic director Long Yu, is the first of a series of orchestras, mostly from the far or Middle East and Australia, to make their debuts at this year's Proms, though neither they nor Yu are by any means strangers to the UK. Founded in 2000, the CPO was heard at the Barbican five years later; Yu, meanwhile, returned to conduct the BBC Symphony last year. A fine orchestra, with superb woodwind, they play with fastidious precision and considerable elegance. Yu, however, seemingly favours interpretative detachment. Though there are strengths and weaknesses in his approach, the emotional pitch of the evening was, if anything, too cool. The love scene from Tchaikovsky's Romeo and Juliet admirably avoided syrupy sentimentality, though the Capulet-Montague brawls were short on both violence and excitement. Mussorgsky's Pictures at an Exhibition, in Ravel's orchestration, contained some ravishing things, such as the poised, dreamy Vecchio Castello, though the work's darker moments, Gnomus and The Hut on Fowl's Legs, failed to disturb. Yu's choice of a curtain-raiser, meanwhile, was Elgar's Pomp and Circumstance March No 4, done with a metronomic rigidity more military than ceremonial. The two very different concertos at the programme's centre were more satisfactory. Haochen Zhang was the soloist in Liszt's First Piano Concerto, flamboyantly moody throughout and injecting some much-needed passion into proceedings. After the interval came the UK premiere of Joie Eternelle, a set of variations on a traditional Chinese melody for trumpet and orchestra, written for Alison Balsom by Qigang Chen, Shanghai-born, Paris-based and a pupil of Messiaen. Beautifully crafted, the score has a haunting, timeless beauty and proved a fine vehicle for Balsom, though its subtle gradations in difficulty more than once took her to the limits of technique and virtuosity. The preeminent Chinese conductor with an established international reputation, Long Yu is the Artistic Director and Chief Conductor of the China Philharmonic Orchestra, which he co-founded in 2000, and the Music Director of the Shanghai and Guangzhou Symphony Orchestras. All three ensembles are among China’s finest and tour actively at home and abroad in addition to regular seasons featuring the world’s top soloists. Maestro is also the Founding Artistic Director of the Beijing Music Festival which, now in its 15th season, is the internationally recognized hub of musical life in China’s capital. Long Yu shares the position of Artistic Co-Director of the MISA Festival with Charles Dutoit, bringing classical music to the young people of Shanghai. Maestro Long Yu regularly appears with the world’s leading orchestras and opera companies including Munich Philharmonic, Orchestre de Paris, BBC Symphony, Hamburg State Opera, Maggio Musicale Fiorentino, Teatro La Fenice, Chicago Symphony Orchestra, Philadelphia Orchestra, New York Philharmonic, Los Angeles Philharmonic, Sydney Symphony, Hong Kong Philharmonic, Tokyo Philharmonic and Singapore Symphony. Maestro has been invited to return to the New York Philharmonic three times in the next two seasons with programs featuring Yo-Yo Ma, Yuja Wang, and other soloists. Long Yu’s latest New York performance featuring a mix of core classical repertoire and works by contemporary Chinese composers was televised by PBS and BTV (Beijing) reaching a combined audience of millions of people. Leading the development of orchestral landscape in China, Long Yu has created the nation’s first orchestral academy as a partnership between Shanghai Symphony Orchestra, Shanghai Conservatory and the New York Philharmonic. His dynamic vision is focused on introducing China’s growing audiences to key Western repertoire including Wagner’s Ring Cycle, Mahler Cycle, as well as works of Richard Strauss, Benjamin Britten, and many others. A champion of new music, Maestro has commissioned works from today’s most prestigious composers such as Krzysztof Penderecki, Philip Glass, John Corigliano, Guo Wenjing and Ye Xiaogang. For the first time in history, a Chinese orchestra performed at the Vatican under Maestro Long Yu’s baton. The Holy Father Pope Benedict XIV attended China Philharmonic’s performance in the Paul VI Auditorium and praised it as a big step in promoting co-operation between East and West. A passionate supporter of cultural dialogue, Long Yu brought together the top Asian musicians such as Myung-whun Chung, Midori, Lang Lang, Yo-Yo Ma, and Ray Chen for the 2010 Canton Asian Music Festival in connection with the XVI Asian Games in Guangzhou. The festival also featured a rare appearance of the National Symphony Orchestra of Taiwan in mainland China. Earlier that year Long Yu led the Shanghai Symphony Orchestra in a historic joint performance with the New York Philharmonic on the Great Lawn of Central Park, attended by nearly 100,000 people and broadcast to an even wider audience in China, in celebration of the World Expo. Deutsche Grammophon has released Maestro Long Yu’s recordings of Wagner Tannhäuser Overture, Brahms Piano Quartet in G Minor in Arnold Schoenberg’s orchestration, and a wide range of Chinese orchestral music including Yellow River Concerto with Lang Lang. His recordings on Naxos include Korngold and Goldmark Violin Concertos with Vera Tsu as well as Ding Shande’s Long March Symphony. Long Yu was born in 1964 into a family of musicians in Shanghai. His grandfather Ding Shande, a composer of great renown, inspired his passion for music and encouraged him to study at the Shanghai Conservatory and the Hochschule der Kunst in Berlin. Upon his return to China, Maestro was appointed Principal Conductor of the Central Opera Theatre in Beijing. Long Yu is a Chevalier dans L’Ordre des Arts et des Lettres and the recipient of the 2002 Arts Patronage Award of the Montblanc Cultural Foundation. In 2005 the Republic of Italy honored Maestro Long Yu with the title of L’onorificenza di commendatore. The conductor, making his subscription debut, was Long Yu, a towering figure in the Chinese music world, where he heads an impressive number of institutions, including the China Philharmonic Orchestra, the Guangzhou Symphony Orchestra, the Beijing Music Festival and the Shanghai Symphony Orchestra. It’s in that last capacity that he has become a close partner with the New York Philharmonic. The two orchestras recently embarked on a partnership that centers on the creation of the Shanghai Orchestra Academy, an educational venture for aspiring orchestral musicians that offers coaching, workshops and mock auditions. On Wednesday, the New York Philharmonic announced plans to deepen that relationship in the coming season. On Thursday, Mr. Yu proved himself a conductor with a knack for both sumptuous lyrical passages and punchy fortissimos. Pugnacity is a characteristic he has displayed previously in New York: In 2012, he fought off a man who attacked him on Columbus Avenue and went on to conduct the New York Philharmonic in a Chinese New Year’s Concert the following night with a black eye. In the opening two movements of the Shostakovich, there were moments of stellar music-making, but they often came across as episodic. There could have been more storytelling in the shaping of the transitions and more character in the tauntingly chirpy theme that gets passed around different instruments, falters and then regroups. Mr. Yu’s direction was always assured, and he allowed the individual solos the breathing room to unfold, but it wasn’t always clear what they stood for. Was the lovely flute solo in the first movement intended as hopeful, mystical or escapist? There was much more narrative tension in the final movement, where Mr. Yu offered a tight and dramatic reading. NEW YORK (AFP) - China's leading conductor, Long Yu, has set a goal of expanding his orchestra's exposure to the world. But as he spends time in the West, he has also found another mission - showcasing the diversity of Chinese music. "People know very little about Chinese music, actually, even people who talk a lot about the elements that Debussy used from the Far East," Yu said before conducting his premiere subscription series with the New York Philharmonic. "Most people see what happens as like a Chinatown culture," exotic and compartmentalised, he said. 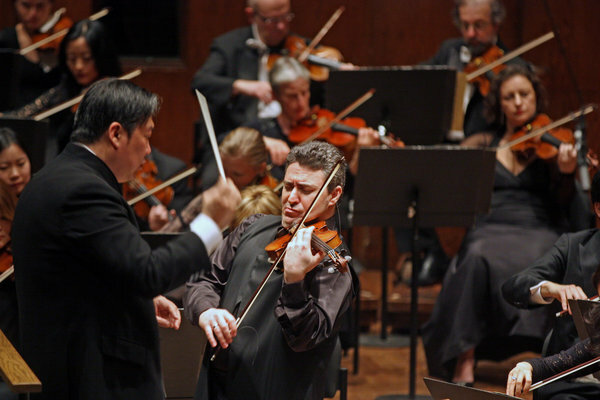 Yu on Feb 24 will return to the New York Philharmonic to celebrate the Chinese New Year. The concert will feature Yo-Yo Ma on cello for the first US performance of modern Chinese composer Zhao Lin's Duo, which also highlights the sheng - a bamboo reed instrument common in Chinese operas. Yu, who is music director of the Shanghai Symphony Orchestra, said he hoped to shine a greater spotlight both on contemporary Chinese composers and the music of the country's large minority populations. "I want to give people a discovery tour of the musical life of China," Yu said. Yu, who has led Chinese New Year concerts in New York since the annual galas started in 2012, has put a top priority on raising the international profile of his orchestra and of Chinese musicians. He last year led the Beijing-based China Philharmonic Orchestra in its debut at the BBC Proms at Royal Albert Hall and recently was honoured by France as a Chevalier dans L'Ordre des Arts et des Lettres. In September, an inaugural class of 22 young Chinese musicians began training with New York Philharmonic performers in an initiative called the Shanghai Orchestra Academy. Yu, who last year turned 50, said he wanted his legacy to include education of Chinese musicians who often did not have the resources to train overseas or even to see top-quality performances. "If we can give them a chance to study with top musicians in the world, particularly from the New York Philharmonic, it is a luxury and a service to the young generation," he said. In one key difference from most Western conservatories, Yu's initiative trains musicians for careers in orchestras rather than honing soloists' skills. Yu, however, played down cultural differences between Chinese and Western musicians, saying that the main gap was in training. But one key divergence lies in history. While Western-style classical music has enjoyed a following in China for more than a century, the Cultural Revolution starting in the 1960s sought to eradicate any art not seen as extolling the communist system. Yu - whose grandfather, Ding Shande, was a prominent composer who died in 1955 - felt the Cultural Revolution first-hand as a child. "For almost eight or 10 years, we could not in public openly discuss doing classical music. It was quite a difficult time. Our whole classical music life really started 30 years ago," he said. A tall man with a sturdy build, Yu offered a vigorous but firm lead to the New York Philharmonic for Tchaikovsky's Violin Concerto. The audience, however, was most enraptured by violin soloist Maxim Vengerov whose intense performance was his first at the Philharmonic in more than eight years. For the subscription debut that closed Saturday, Yu also conducted the Philharmonic in the Fifth Symphony of Shostakovich - a composer well-acquainted with the struggles of navigating communist politics. Yu himself has pushed the envelope on political boundaries. He helped bring to mainland China the National Symphony of Taiwan - which Beijing considers a renegade province - and conducted the China Philharmonic in Rome in a performance attended by then pope Benedict XIV, even though Beijing has no diplomatic relations with the Vatican. With much talk in the West about how China will rise, Yu believes that, in music, his country will have a major presence. "Probably in the future, China will become one of the largest classical music markets," he said. My childhood coincided with the Cultural Revolution. During this period there was a ban on Western music, and I learned music theory through Chinese music. My generation was one of the first to study abroad, and after attending the Shanghai Conservatory, I studied at the Hochschule in Berlin, where a new world of recordings and music opened up to me. I don’t remember the first record I bought, but these times in Berlin were a time of deep exploration for me. I studied great conductors such as Karajan. To this day, I look back on my time in Germany and the recordings I studied with great affection. ... and the most recent? Yo-Yo Ma’s Bach Trios with Chris Thile and Edgar Meyer. I am interested in learning more about many genres – pop, rock, and jazz. Exploring outside of classical music sometimes informs my approach to traditional repertoire. If you had time learn a new instrument, what would it be? Before I was a conductor, I was a pianist and percussionist. My grandfather, a gifted composer and pianist, taught me to play the piano from an early age. He also guided me to become a conductor. He said the baton can lead you to a magical world, which is much more interesting because conductors experience different kinds of music including operas, concertos, and symphonic works. Having the faculty of an entire orchestra’s instruments now seems imperative to me. Did you ever consider a career outside of music? Doing what? I am lucky to conduct orchestras all over the world, and music offers a common language in which to communicate. This is probably what I enjoy most about my job; if I were not a musician, I would still want to connect people, perhaps through diplomacy. I want young people to love music. If I could change one thing, I would make the classical concert accessible to as many people as possible. What or where is the most unusual place/venue you’ve performed? Last year, I had the great pleasure of touring in China with Yo-Yo Ma. We performed at some incredible places including an outdoor concert at the Old City Wall in Xi’an in Central China, and in Dunhang, at the edge of the Gobi Desert. We worked with young people in these places and encouraged them to continue their musical life. It was a very special experience for both of us. I remember my formative years in Berlin watching Karajan and many of the last generation’s legendary artists. I will carry these concerts with me my entire life. In 1979, I was in the audience as Isaac Stern made his first appearances in China. I was 15 years old and I hadn’t ever heard violin playing like his. Years later, I was honoured to invite Maestro Stern to the Beijing Music Festival. Last year, the Stern family and I started the Shanghai Isaac Stern International Violin Competition to honour the importance and the impact of Maestro Stern’s visits to China. He brought many Chinese musicians to the world stage. I would love to travel to Vienna 7 May 1824 for the premiere of Beethoven’s Ninth Symphony. Can you imagine what it what have been like to be in the audience for that final movement when the chorus comes in? Or, to have seen Beethoven’s face when, not able to hear the audience, he finally turned around at the podium to see their wildly enthusiastic reaction? An incredible moment. In the last 50 years, there have been so many important composers such as Messiaen, George Benjamin, and Qigang Chen, who all all use their creative voice to move music a big step forward. Imagine you’re a festival director with unlimited resources. What would you programme - or commission - for your opening event? This October we’re celebrating 20 years of the Beijing Music Festival where, since founding it two decade ago I have been lucky to realise many of my musical dreams. This celebratory year, we are presenting co-productions with the Salzburg Easter festival and the Aix-en-Provence festival, and a Beethoven symphony cycle with Paavo Järvi and the Deutsche Kammerphilharmonie Bremen. The festival is such an important part of Chinese cultural life and has planted many classical music seeds in China.